When treated with bromine (Br2) and light (hν) alkanes are converted into alkyl bromides. Bromination of tertiary carbons is selective when in absence of any double bonds. 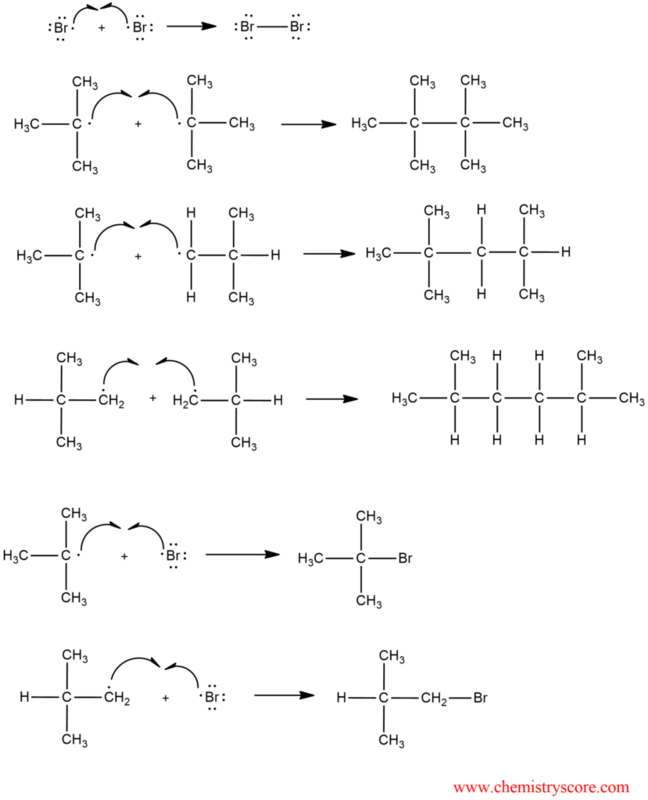 The bromination mechanism is the same as for any other free radical halogenation and consists of three stages: initiation, propagation, and termination. Initiation: Creation of radicals – When bromine (Br2) treated with light (hν) it comes to homolytic cleavage of the Br-Br bond. A bromine atom attacks 2-methyl propane by abstracting hydrogen atom with which they form a hydrogen bromide and a tert-butyl radical. A tert-butyl radical abstracts a bromide atom from one of the starting Br2 molecules and new bromide atom react with a new molecule of starting substance in propagation step 1. These results indicate that the tendency for bromination at the tertiary position is much more pronounced, with 99% of the product occurring from the reaction at the primary position.